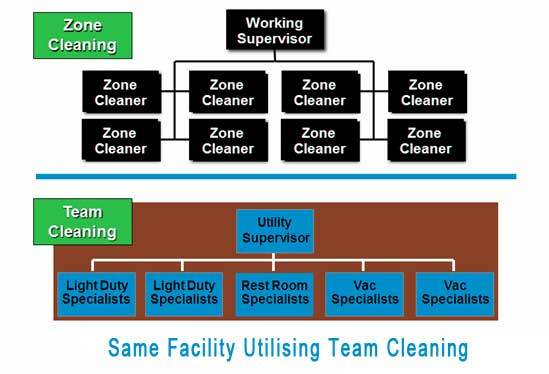 What are the differences between zone cleaning and team cleaning? 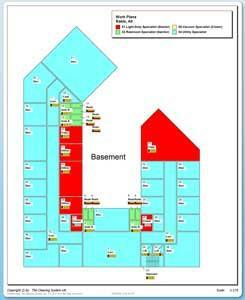 Zone cleaning means one employee performs all tasks for a specific floor or section of a building. This system gives the worker a sense of “ownership” as they are responsible for a specific area. 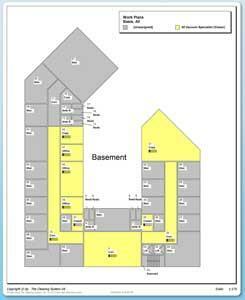 The individual gets to know all the ins and outs of the specific area that he or she is assigned to. Because the individual performs all the cleaning tasks for their building or area, there is less of a chance of boredom, which can be a problem with other forms of cleaning. In addition, security is less of a concern as fewer individuals will have keys to a particular building or area. Light Duty Specialist: Dusting, emptying trash, spot cleaning. Vacuum Specialist: Vacuuming carpets as well as hard floors. Restroom Specialist: Cleaning, sanitizing and restocking supplies in restrooms. Utility Specialist: Cleaning lobby areas, spot cleaning glass, mopping and scrubbing hard floors, and moving rubbish to the bins or compactors from central collection points. You may want to customise a specialist’s duties to fit a particular building. One of the advantages of team cleaning has to do with training. You do not have to train an employee in all areas of cleaning. It may even be difficult to find employees that are adept enough to become an expert in all areas of cleaning. By focusing on certain types of work, the team members will become more skilled and efficient in their particular tasks, meaning greater overall efficiency and an overall cleaner building. Team cleaning also means less equipment. With zone cleaning, each cleaning employee needs a vacuum, brute, and restroom cleaning supplies. When using a team cleaning approach you only need one “whole set of equipment” for an entire building as each individual will only use one piece of equipment for each task. There are benefits to each cleaning system, and the cleaning system you use in your buildings will depend on several factors. This includes the size of the building, the number of employees cleaning in the building, the number of buildings you clean, and your client’s individual needs. Implementing the right cleaning system will help keep your costs down and your profits up. The Cleaning System can be used as a powerful, accurate and visual tool for both cleaning approaches.